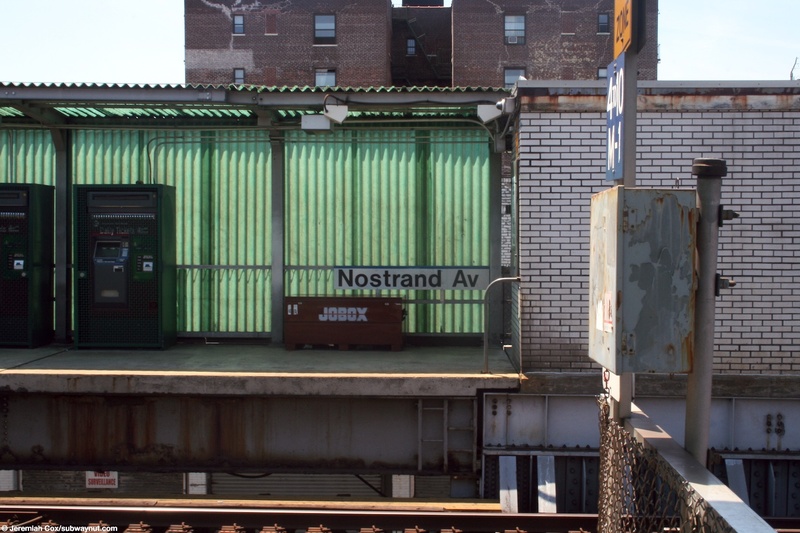 The Nostrand Avenue (or Nostrand Av, Ave, or Avenu depending upon the platform sign) Station feels like a conventional subway elevated station with its own unique twist and is located in the middle of Atlantic Avenue on a very low structure, just west of the stop the tracks dip underground for the rest of their run to Flatbush Avenue, now renamed Atlantic Terminal. 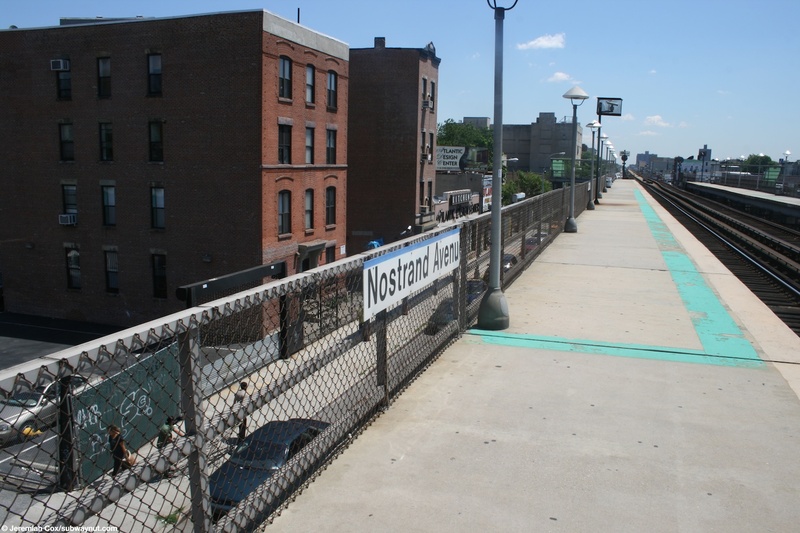 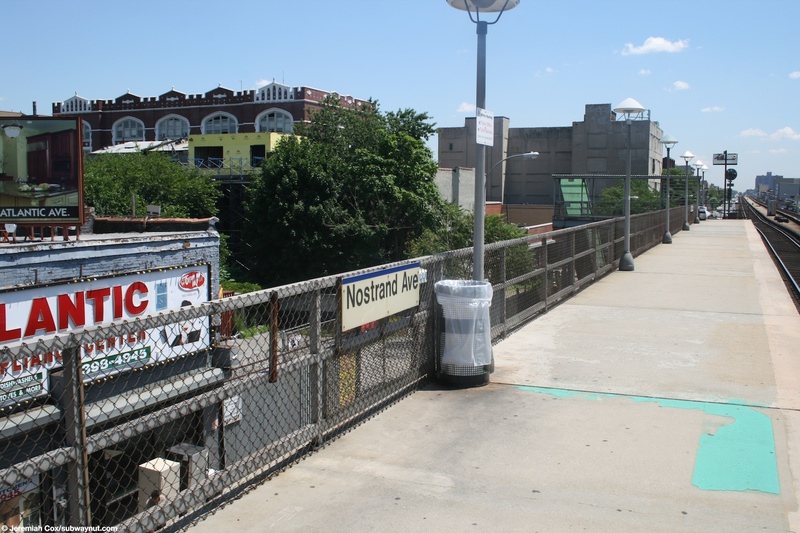 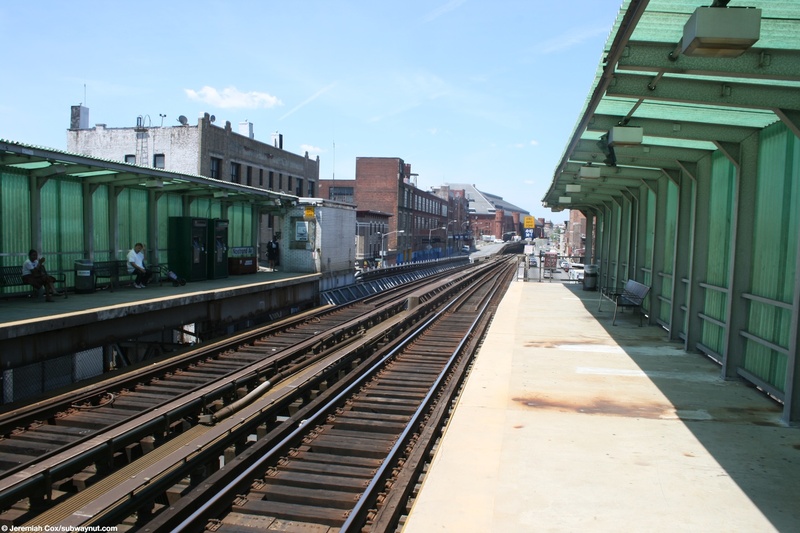 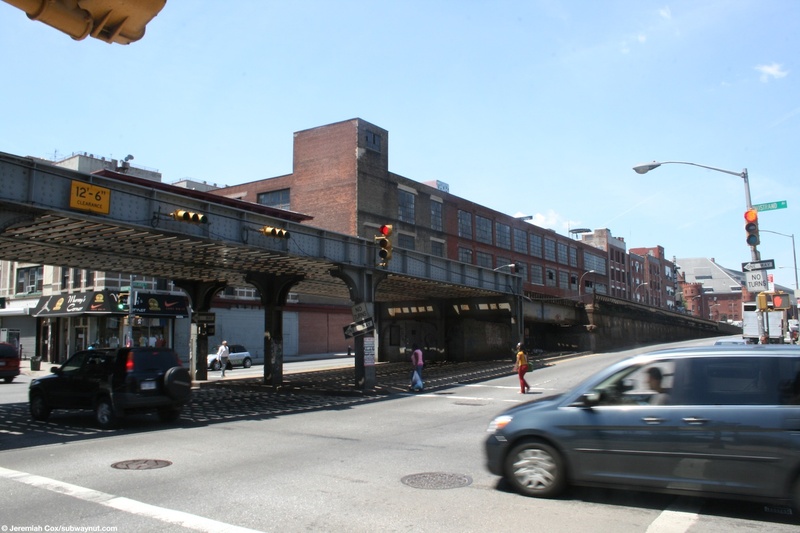 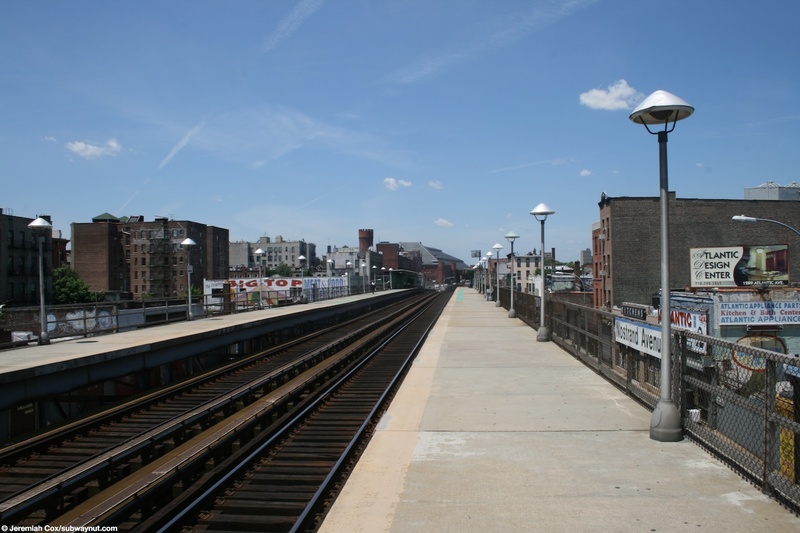 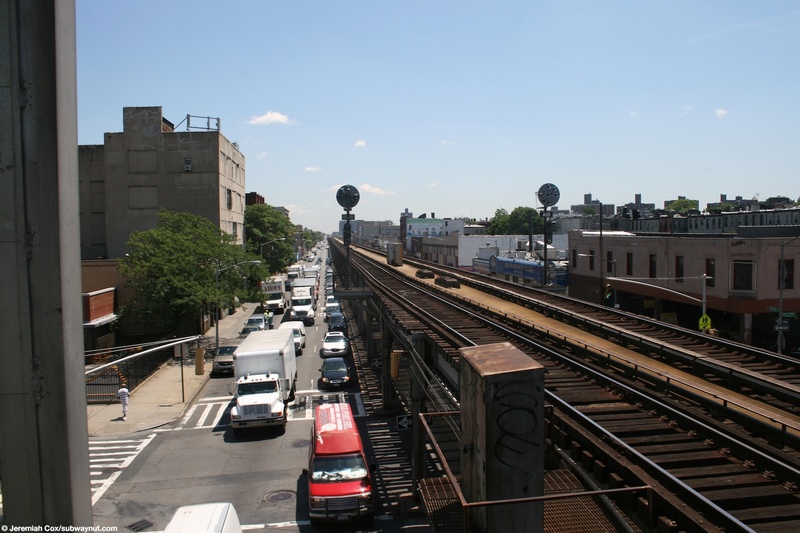 The elevated line is so narrow that it has no fencing (the two side platforms of this station do), and the standard wooden boards that allow weather such as snow to fall beneath the tracks. 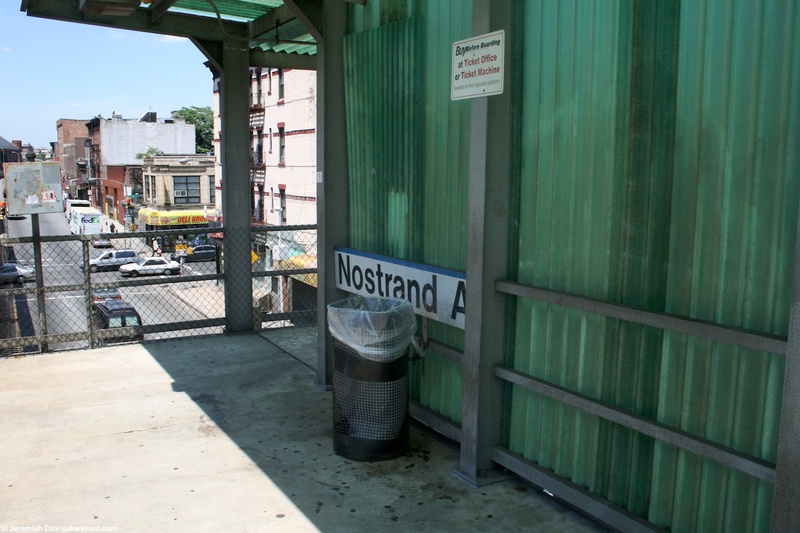 The stop is two blocks south of the Nostrand Avenue-Fulton Street Subway station and signs on the platforms tell riders of the transfer. 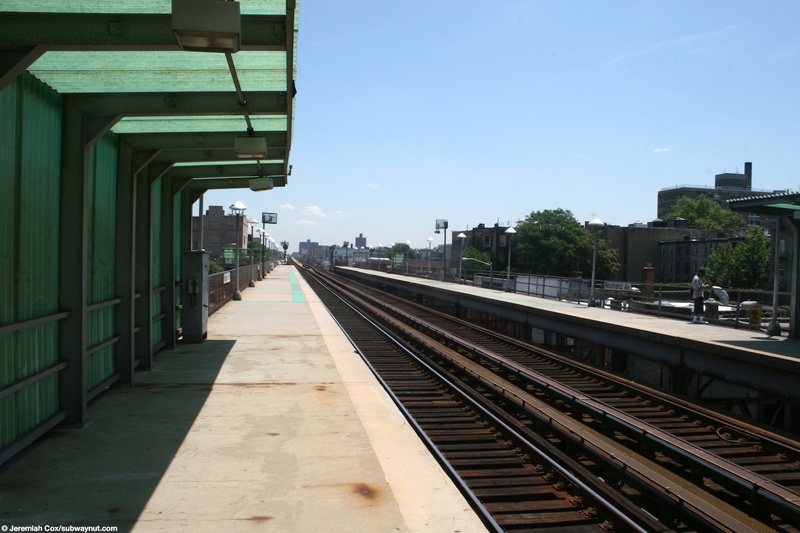 The two side platforms for the two track line are extremely simple and narrow but are made out of concrete. 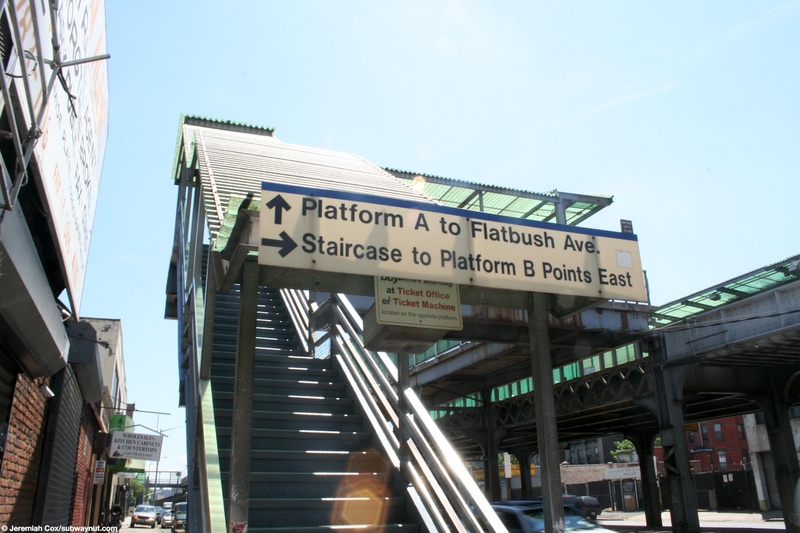 For access: each platform at their western end each platform has a staircase up to a bridge across a portion of Atlantic Avenue to reach the train tracks that are in its median. 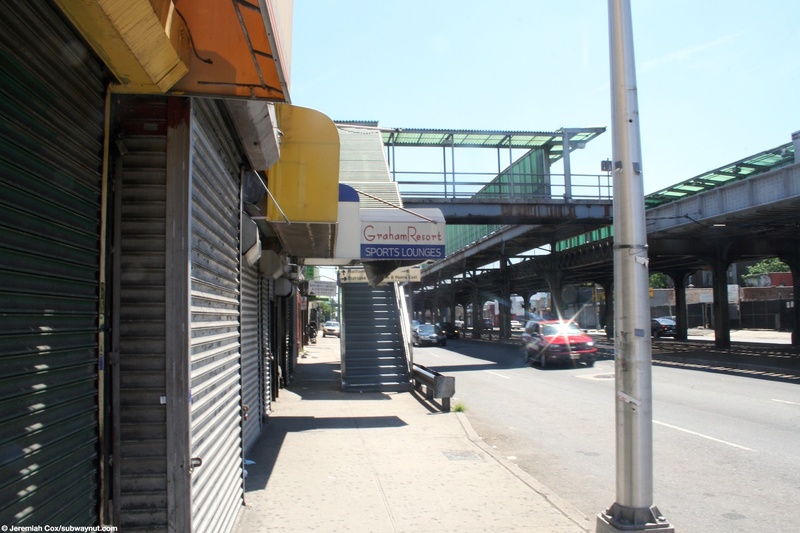 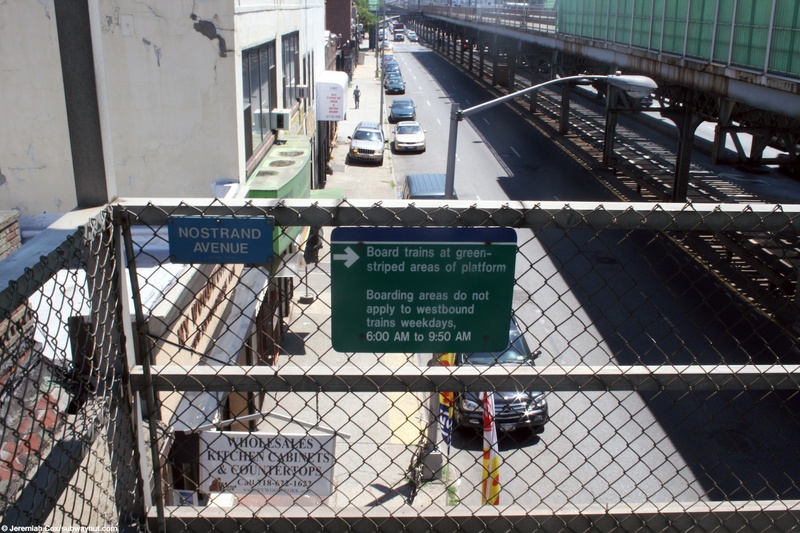 These staircases are a short ways beyond the intersection of Nostrand Avenue. 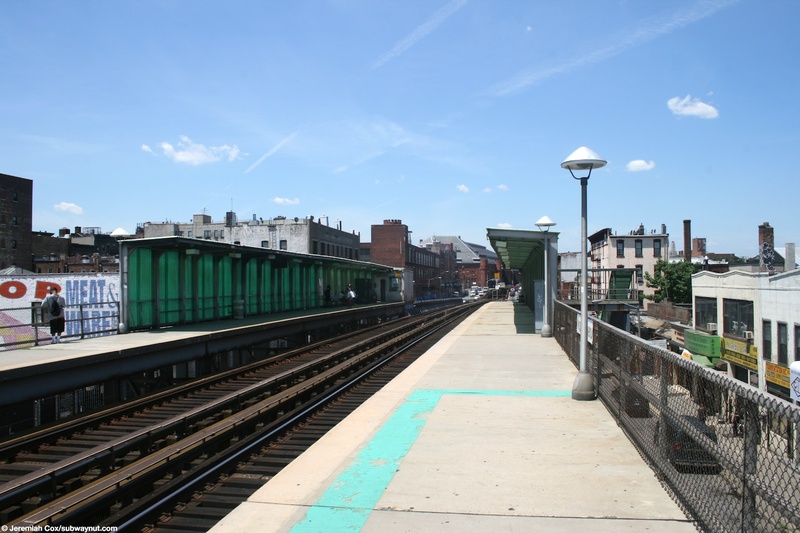 At this end of the platform is the stations only form of shelter, a canopied area that covers maybe two cars with a green translucent windscreen and roof. 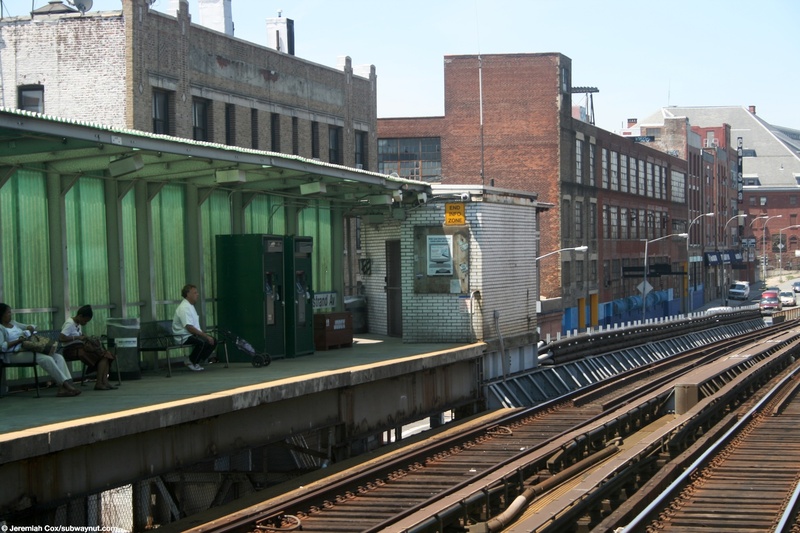 Alongside the entrance to the Eastbound platform is a small white brick shed that was a ticket office and still staffed until it was closed with budget cuts on August 19, 2009. 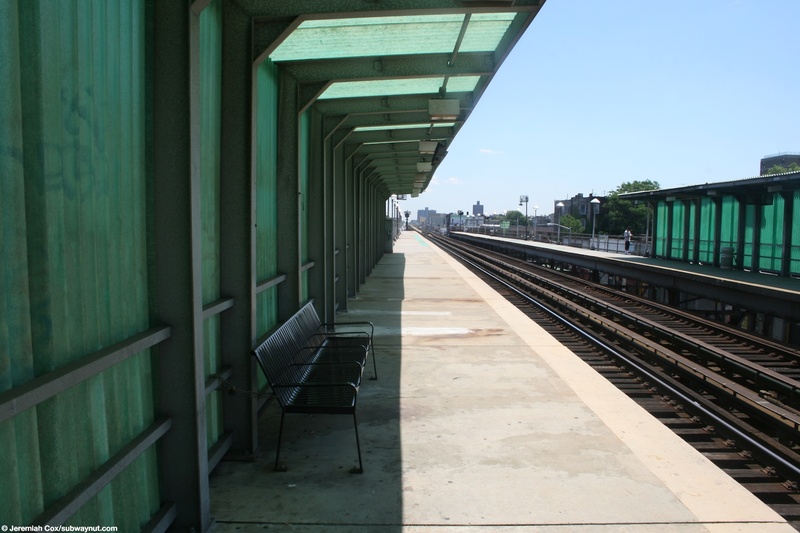 The simple window looks outside to the platform. 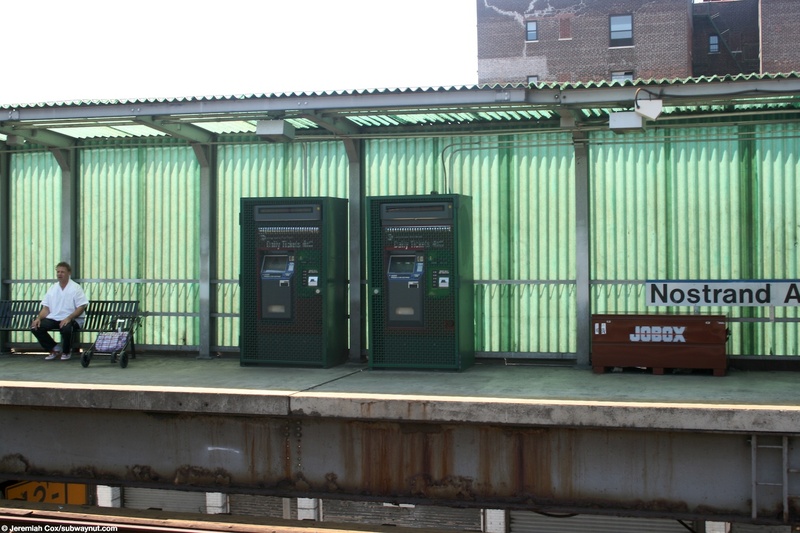 There are two secure with extra grates across them TVMs on the Eastbound platform for tickets. 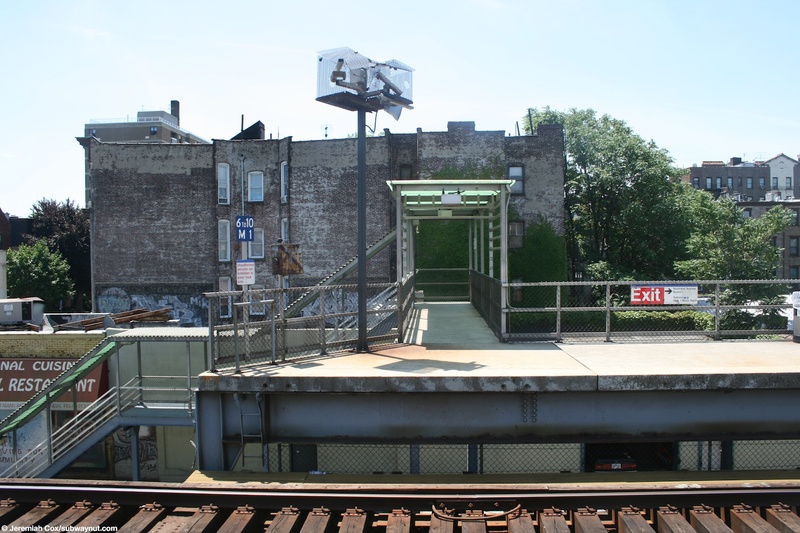 The platform has quite few security cameras surrounded by meshed fencing. 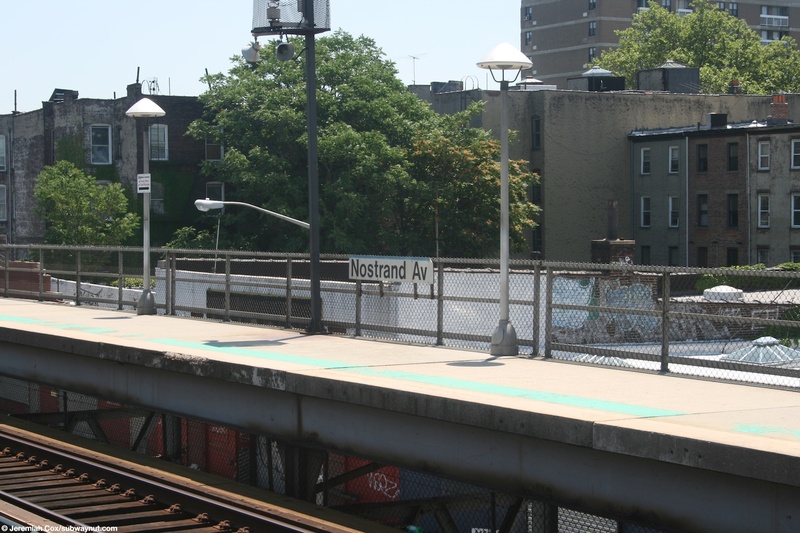 There are additional bridges to staircases from the respective sides of Atlantic Avenue at the other end of the station the west corners of the intersection of New York Avenue. 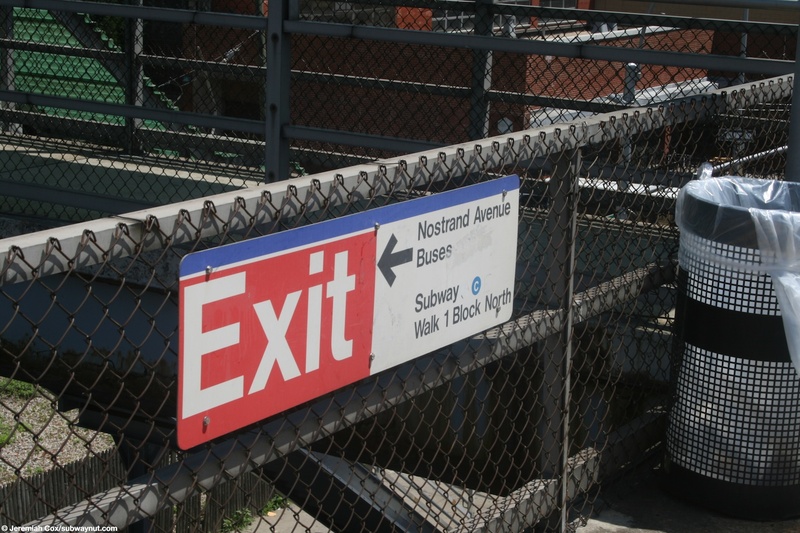 New Signage: The station has recieved new subway style black with white text signage that is unique to this station. 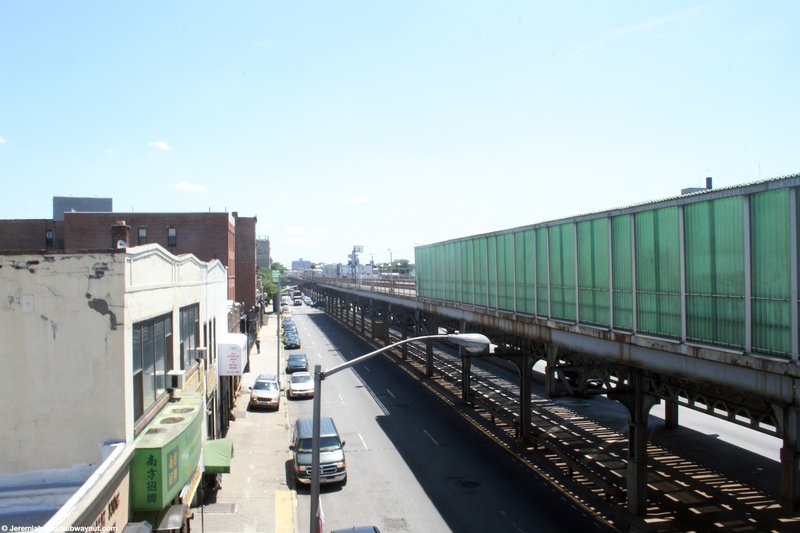 The elevated that the LIRR takes above Altantic Avenue was rebuilt in 2011 and the new elevated structure has fencing along it sides (plus narrow yellow catwalks) so trains no longer overhang the sides of structure.